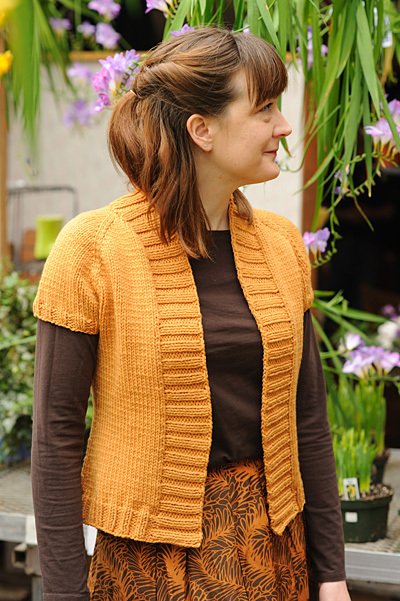 When designing Leaflet, I knew that I wanted a little cardigan that I could wear throughout Fall. So I decided on short sleeves, an open front that could be pinned closed, a fun Fall color and my favorite aran weight yarn. I then found this gorgeous leaf pattern in a stitch dictionary and re-worked it so that it could be used as a single central panel down the back. I love pieces with details on the back, it always feels like a little secret. Leaflet is worked from the top down in one piece with raglan shaping. The collar is picked up and knit after the body is complete. Note: See Pattern Notes re. length. Note: Larger sizes may prefer longer needle. As written, all sizes measure 20 inches in length. This is done so that the Leaf Panel on the back will appear as shown in the sample. 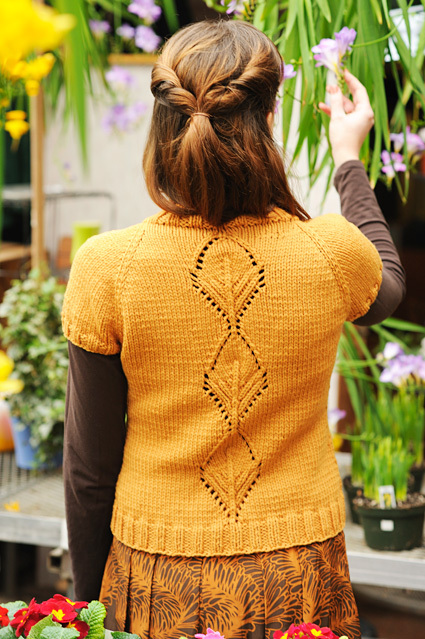 If a longer cardigan is desired, be sure to buy more yarn. Using circular neede and long-tail cast on method, CO 37 sts. Row 1 [WS]: P2, place marker, p4, place marker, p5, place marker, p15 (counts as Row 1 of Leaf Panel), place marker, p5, place marker, p4, place marker, p2. Row 2 [RS]: Kfb, *RLI, k1, slip marker, k1, RLI, k2, RLI, k1, slip marker, k1,RLI*; k4, work Row 2 of Leaf Panel over next 15 sts, k4, repeat from * to *, kfb. 47 sts. Pattern is set for yoke: Sts between third and fourth markers are worked following Leaf Panel Chart, all other sts worked in stockinette st.
Row 3 [WS]: Work all sts in pattern. Row 4 [RS]: Kfb, *k to 1 st before marker, RLI, k1, slip marker, k1, RLI*; repeat from * to * once, k to marker, work next row of Leaf Panel, repeat from * to * twice, k to last st, kfb. 10 sts increased. Repeat Rows 3-4 three times more. 87 sts. Raglan Increase Row [RS]: *K to 1 st before marker, RLI, k1, slip marker, k1, RLI*; repeat from * to * once, k to marker, work next row of Leaf Panel, repeat from * to * twice, k to end. 8 sts increased. Repeat these 2 rows 3[8, 14, 14, 13, 12, 13] times more. 119[159, 207, 207, 199, 191, 199] sts: 16[21, 27, 27, 26, 25, 26] sts for each front, 22[32, 44, 44, 42, 40, 42] sts for each sleeve, 43[53, 65, 65, 63, 61, 63] sts for back. Work Raglan Increase Row. Work 3 rows in pattern. Repeat these 4 rows 3[1, -, -, -, -, -] times more, then work Raglan Increase Row once more. 159[183, -, -, -, -, -] sts. Work Raglan Increase Row. 215 sts. Next Row [WS]: *Work in pattern to 2 sts before marker, m1p, p2, slip marker, p to next marker, slip marker, p1, m1p*; p to marker, work next row of Leaf Panel, repeat from * to * once, p to end. 219 sts. Work Raglan Increase Row once more. 227 sts. Next Row [WS]: *Work in pattern to 2 sts before marker, m1p, p2, slip marker, p to next marker, slip marker, p1, m1p*; k to marker, work next row of Leaf Panel, repeat from * to * once, p to end. 4 sts increased. Repeat these 2 rows -[-, -, -, 1, 2, 4] times more. -[-, -, -, 223, 227, 259] sts. Repeat these 2 rows -[-, -, -, 0, 1, 0] times more, then work Raglan Increase Row once more. -[-, -, -, 247, 267, 283] sts. 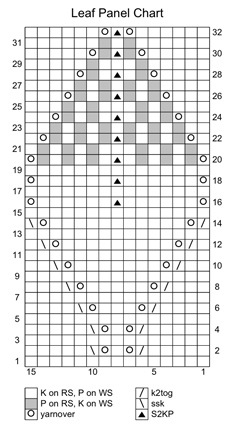 There are 159[183, 207, 227, 247, 267, 283] sts: 21[24, 27, 30, 33, 36, 39] sts for each front, 32[38, 44, 48, 52, 56, 58] sts for each sleeve, 53[59, 65, 71, 77, 83, 89] sts for back. Remove raglan markers when working next row; leave markers on each side of Leaf Panel in place. Use backward loop method for casting on underarm sts. Dividing Row [RS]: *K to marker, place next 32[38, 44, 48, 52, 56, 58] sts (all sts to following marker) on waste yarn for sleeve, CO 6 sts, placing marker after first 3 sts to indicate center of underarm*; k to next marker, work next row of Leaf Panel, repeat from * to * once, k to end. 107[119, 131, 143, 155, 167, 179] sts. 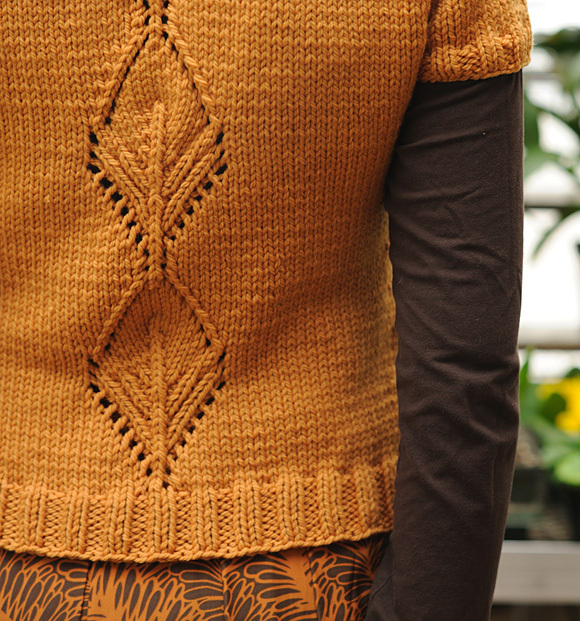 Lower body is worked in stockinette st, with sts of Leaf Panel worked in pattern as set. Work 5 rows in pattern, ending with a WS row. Waist Decrease Row [RS]: *Work in pattern to 3 sts before underarm marker, ssk, k1, slip marker, k1, k2tog; repeat from * once, k to end. 4 sts decreased. Work 7[7, 5, 5, 5, 5, 3] rows in pattern. Work Waist Decrease Row. Repeat these 8[8, 6, 6, 6, 6, 4] rows 1[0, 2, 2, 1, 0, 2] times more. 95[111, 115, 127, 143, 159, 163] sts. Work 5[5, -, -, 3, 3, -] rows in pattern. Work Waist Decrease Row. Repeat these 6[6, -, -, 4, 4, -] rows 0[1, -, -, 0, 1, -] time more. 91[103, -, -, 139, 151, -] sts. Increase Row [RS]: *Work in pattern to 1 st before underarm marker, RLI, k1, slip marker, k1, RLI; repeat from * once, k to end. 4 sts increased. Repeat these 6 rows three times more. 107[119, 131, 143, 155, 167, 179] sts. You will have just completed RS Row 26[26, 26, 30, 30, 30, 32] of Leaf Panel. Work 10[10, 10, 6, 6, 6, 4] more rows in pattern; you will have just completed Row 4 of Leaf Panel. Note: If more length is desired, work more rows in pattern before proceeding to lower ribbing, ending with a RS row. If you only want to add a little more length, repeating Rows 1-4 of chart will lengthen the “stem” at the base of the last leaf. Row 1 [WS]: P to first marker, p2, m1p, p to end. 108[120, 132, 144, 156, 168, 180] sts. Row 2 [RS]: K1, [p2, k2] to last 3 sts, p2, k1. Row 3 [WS]: P1, [k2, p2] to last 3 sts, k2, p1. These 2 rows set 2x2 Rib for lower ribbing. Work 6 more rows in pattern. Place 32[38, 44, 48, 52, 56, 58] held sts of one sleeve on double-point needles. Using double-point needle and with RS facing, pick up and k 6 sts (1 st in each CO st) along underarm edge, placing marker after third st to indicate end of round; k held sts, k to marker. 38[44, 50, 54, 58, 62, 64] sts. Next Round: K3, [p2, k2] to last 3 sts, p3. This round sets 2x2 Rib for sleeve. Work 3 more rounds in pattern. Weave in ends and block to measurements shown. With RS facing, using circular needle and beginning at lower right front corner, pick up and k 4 sts for every 5 rows along right front edge, pick up and k 1 st in every st along CO neck edge, and 4 sts for every 5 rows along left front edge, ending at lower left front corner. Count sts. When working first row, increase or decrease 1 or 2 sts as necessary to obtain a multiple of 4 sts. Next Row [WS]: [P2, k2] to end. This row sets 2x2 Rib for front band. Work 12 more rows in pattern. Note: It is important that the front band is not bound off too tightly. You may wish to use a larger needle to bind off. 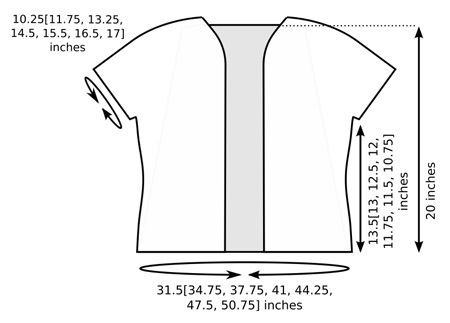 Try sweater on before fastening off to ensure that edge is bound off loosely enough. Cecily lives in Portland, Maine, with her husband, Ethan. 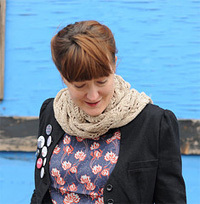 She spends most days (and nights) knitting, designing, sizing and writing patterns and posting on her blog, Winged Knits. The rest of the time of her time is spent with family and friends enjoying the beautiful city of Portland.